As parents and family members, we want the best for our kids. We want them to have rich experiences, healthy relationships and opportunities to shine. We want them to understand right and wrong. We want them to respect others and respect themselves. We do our best to set a good example and talk about the values, attitudes and behaviours we hope our children will develop as they grow up. But sometimes, without meaning to, we might say things that excuse disrespectful behaviour in young people. To break the cycle of violence against women we must understand how it is linked to disrespect and gender inequality. dismissing someone’s beliefs, or how they feel about something. Research tells us that, from a young age, boys and girls start to believe there are reasons and certain situations that make disrespectful behaviour acceptable. Some of the things adults say or do may unintentionally give the message that this behaviour towards women is OK. It is important to be aware of the things we say to our children because parents and other family members have the greatest potential to shape positive attitudes. 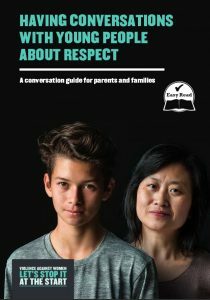 This guide is a practical tool to help you talk more confidently and openly about respect with young people. 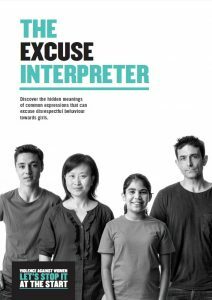 You can also use the Excuse Interpreter to uncover how the everyday expressions we use may send the wrong message, and the Respect Checklist to explore what you think your child understands, or topics to cover during conversations. What has disrespect got to do with violence against women? Violence against women can start with disrespect. Without realising it, we may be making excuses for disrespectful behaviours in young people. Although we may not have intended it, these excuses can allow disrespect to grow. There are many influences on young people’s ideas about the role of men and women and how they should relate, including popular culture and peers. However, the adults in their lives – especially parents and other family members – leave the deepest imprint. Even though most Australians think violence against women is wrong, we don’t always know how or when to change things. 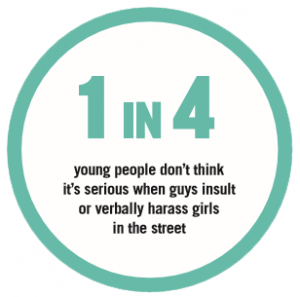 In fact, without realising it, we sometimes allow boys to develop disrespectful attitudes toward women and teach girls to tolerate disrespect or downplay the serious impacts on girls’ self-esteem. As the figures below show, these attitudes have somehow become a normal part of growing up. When we talk to young people about disrespect it’s important to be clear about what is acceptable. What we think and do becomes normal for us very quickly, so it can be hard to challenge ourselves. But if we don’t challenge our thoughts and actions about the roles of men and women, and what’s OK, we might unintentionally be excusing disrespect, aggression and potentially violence. Our young people can misunderstand what we say and see it as an excuse or permission to behave in a certain way. If this continues to happen, nothing will change. Before we can have a conversation with young people we need to take a moment for honest self-reflection. For parents, this can mean confronting our own beliefs about boys and girls or men and women, as these can form the basis for our reactions. When thinking about our own reactions, we might be surprised to recognise some of the most common ways we excuse disrespectful and aggressive behaviour. blaming girls for being treated with disrespect. 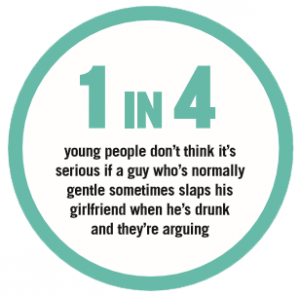 Responding in this way teaches young people that this behaviour is acceptable in certain circumstances and portrays it as a normal, even playful, aspect of boys’ behaviour towards girls. 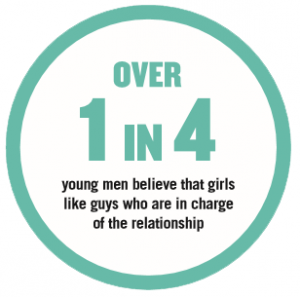 When we take the boys’ side, it can imply that boys and men find it harder to control themselves or they must have had a reason for their behaviour. Responding in this way teaches young people that disrespectful or aggressive behaviour is more acceptable among boys. Sometimes we shift the blame when a male is disrespectful or aggressive towards a female. This may imply that she must have done something to provoke the behaviour or manipulated the situation. Did you say something he didn’t like? Responding in this way teaches young boys that it is not always their fault if they are disrespectful or aggressive, and teaches young girls to question if they themselves are to blame. As parents and family members, you never know when a situation will open the door for important conversations with your children. By thinking through what you believe, what you might say and how you can have positive conversations with your son or daughter, you will feel more confident to make the most of each opportunity. You might be in the car, shopping, making dinner, watching television or walking the dog. Be prepared to talk when you see or hear something you are uncomfortable with, when your child asks a question or when they just want to chat with you. For example, think about how your daughter might respond to a boy’s insult or teasing, or what your son could do if one of his friends showed him a photo of a girl without her permission. 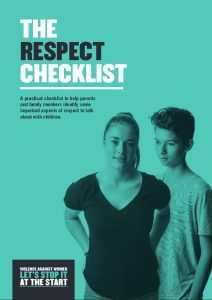 Take a look at the Respect Checklist for more topic ideas.Try to take advantage of opportunities that come up in everyday situations, so that ‘difficult’ conversations become normal, your children know where you stand and that they can talk to you. You may find it helpful to illustrate your points with examples from television or other situations you have observed together. For example, if you hear a comment in a news story that a woman who was hurt by a man shouldn’t have been out on her own, you could use this to talk about views that women are to blame. As before, the Respect Checklist has some other topics that could help you get started. Let your children know that respect and disrespect aren’t simple issues. Acknowledge that you may not have all the answers, but that you do know it’s important we treat others with respect and that others respect us. Explain that we should not excuse behaviour that is potentially hurtful or harmful. Ask your children how they feel and what they think during conversations. Then you can discuss their responses, taking the opportunity to educate them and tell them what you think. For example, you can talk to your daughter about what might happen if a boy was verbally aggressive toward them. Ask them how they might feel, what they might be thinking, what they would do, and how they would feel about taking action. Children are surrounded by many different and sometimes conflicting influences, such as peers and the media. This can be confusing and can make it hard to know how to react in different situations.You can help guide them by talking regularly about issues they face and by supporting them to feel confident in the actions they take. If you have a son this may be about showing respect to girls and not demeaning them in any way, even if their mates are doing it. If you have a daughter, this may be about encouraging her to speak up when a boy teases her or puts her down, not to keep it to herself, and not to feel that it is her fault. Remember that a conversation is about listening as much as talking. What your children tell you provides an important insight into their thoughts and feelings. Listening helps you to understand the attitudes they are forming and to respond to specific issues and challenges they are facing. As a general rule, try and listen more than you talk. As a parent, you are an important teacher for your children. Every day they watch you and listen to you. What you say and do influences their attitudes and behaviours. That’s why it is so important to think about how children could interpret your actions and attitudes. No one expects you to be perfect. The important thing is to be honest and consistent. You could even use personal examples when discussing how not to react to certain situations. This will help you be a positive role model for them. Talk through how your children might handle such situations themselves. If you feel you need to intervene, explain this to your children and do whatever you think is necessary. Even if they say they don’t want you to get involved, children who are at risk of harm do need adults to intervene. Disrespectful and aggressive behaviour aren’t always easy subjects to discuss. We might be concerned about raising issues that will worry or scare young people. We might not want to make a situation worse, or express opinions that could lead to conflict with others. We might be reluctant to discuss things that could affect our relationship with our children, or want to avoid feeling embarrassed or seen as hypocritical. Having the confidence to get started can sometimes be the hardest part. These suggested topic areas and conversation starters will help you take that first important step. You don’t need to have all the answers, but gathering information about the topics you think are important and practising your answers can help when talking about complicated and difficult issues. Respectful relationships between boys and girls. Services like Kids Helpline and 1800RESPECT. 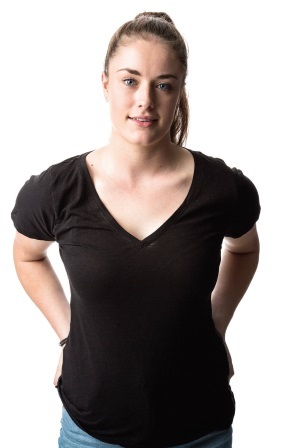 Visit respect.gov.au for more information and support. Why you are both equally ‘in charge’ of a relationship. Remember, you don’t have to have all the answers, but be ready to explore topics together. Do you notice any differences between how boys and girls are treated at school? Do you notice any differences between how boys and girls behave at school? For example, are there any sports at school that mostly boys play? Or are there any activities that mostly girls do? Have you heard something a boy said to a girl did that you didn’t agree with? Have you ever found it difficult to talk to boys/girls? What are the main reasons? What do you think of the way the women/men were treated in that movie? Other examples might be a TV show or game your child enjoys. Can you think of a time you may have treated someone with disrespect? If one of your friends was being disrespectful to you, how would you feel? What would you do? If one of your friends was being disrespectful to someone else, how would you feel? What would you do? If one of your friends was being treated with disrespect, how would you feel? What would you do? If you ever felt unsafe around a boy/girl, where would you go for help? Listen out for cues, and be ready to respond. Sometimes conversations can reveal things you didn’t know about your children. For example, a boy may have picked on them, or a friend may have pressured a girl into doing something she didn’t want to. If this happens, stay calm and keep listening so your children don’t shut the conversation down. Your children might try to play down the seriousness of a situation. They may blame themselves or the person who has been affected by the behaviour, or they may empathise with those who are in the wrong. they have a right to be treated with respect. Even if you haven’t reached an agreement, let them know that it is important to keep talking about these issues. Some young people are very reluctant to talk about difficult issues with adults. If this happens, there are a few things you can do to increase the chances of a more open conversation next time. Calmly set out the issues as you see them and encourage your children to think about them. Always work at keeping the conversation open and let them know you appreciate them speaking to you. Discuss the difficult issues they face and acknowledge it can be challenging to work out what is right. Talk about successes as well as hard times. Recall a time that they showed respect or reacted to a situation in a positive way. Let them know if they ever want to talk or if they feel unsure they can come to you. encourage them to consider the situation through someone else’s eyes—if one of their friends was in this situation, how they would react, and what would they say? talk about actions that could be taken and assure them that you will support them when they are ready (or want) to take action. encourage them to set a good example for their friends. Like anything tricky or challenging, these conversations will become easier with practice. Conversations about disrespect are difficult to have with our children, but they are important. It’s a way of checking in with them and offering advice as their attitudes and behaviours change over time. By setting a good example and talking about these issues regularly, we can teach our children that respect is an automatic starting point for all relationships. Preventative conversations help prepare our children for the future. Then, when they face a situation, they know there are options, and they know there are different ways they can react. By talking with our children and young people about respect and gender equality, we can influence the attitudes and behaviours they take with them into adulthood. As parents, we have the strongest influence. This is multiplied when we work together with other people who are influential in our children’s lives such as other family members, teachers, coaches, managers, religious and community leaders. 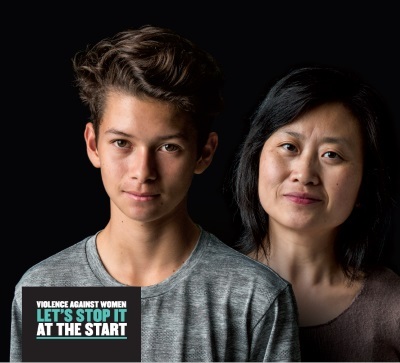 By positively challenging attitudes and behaviours, we can prevent violence against women before it happens. In this way, we are not only doing the best for our own children, we are also playing a critical role in reducing the prevalence of violence against women and their children across our society. A practical checklist to help parents identify some important aspects of respect and gender equality to talk about with children. Discover the hidden meanings behind the words we use to talk about disrespect between men and women. 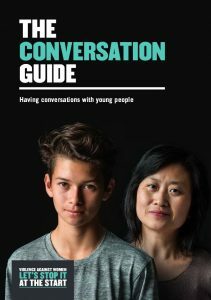 Use the advice and practical tips in the Conversation Guide to plan a positive discussion and talk more openly with boys and girls about respect. Ken Lay: International Day for the Elimination of Violence against Women speech at Monash University, Melbourne. Delivered 25 November 2015. 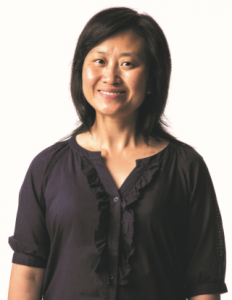 Anne Coutts: Canberra Times ‘Can we begin to change embedded attitudes about violence against women?’ Published 17 February 2016. Rose Batty: Interview with ABC News. Published 25 January 2016.